We hear a lot about mobile marketing and the impact it may or may not have on digital signage. As digital signage providers, we can’t help but wonder what this will mean for digital signage advertising networks or the DOOH industry. Will mobile marketing complement or compete with digital signage? Since I was curious about what others thought, I posted a question on LinkedIn to members of various digital signage groups. 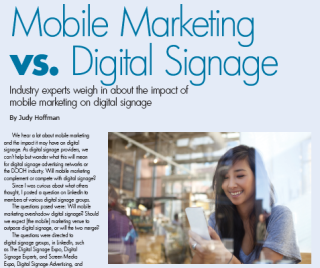 The questions posed were: Will mobile marketing overshadow digital signage? Should we expect [the mobile] marketing venue to outpace digital signage, or will the two merge? The questions were directed to digital signage groups in LinkedIn, such as The Digital Signage Expo, Digital Signage Experts, and Screen Media Expo, Digital Signage Advertising, and Digital Signage Industry Connection. In general, the respondents were from a variety of industries, including marketing and advertising and communications from around the globe. Overall, respondents expressed how mobile marketing and digital signage are very different and appeal to different audiences. But it was the overall opinion that was intriguing. Let’s take a look at what the industry experts had to say. Many times digital signage creates visions of an advertising network. Mobile marketing, on the other hand, brings to mind pesky digital ads. But both are used for one basic reason: to convey a message. The owner of Tigris in Brazil, Thom Shen, defined the likenesses and the differences by saying, "Both are technologies to communicate with people out of home. Digital signage is place-based, and cellphones follow you wherever you go.” According to Shen, it’s all in how we use them. “Still, the success of them will depend on how the technologies are used to impact people out of home and to understand how they manage their time,” he said. “There will be many opportunities for the two technologies to work together to achieve better results." Chris Heap from Imperative Group, a DOOH development and communications agency based in London, said, "Depends on your perspective. Both digital signage and mobile developers see a convergence between the two as it is to an extent an inevitability." Heap mentions, though, that the technologies are not symbiotic just yet, but, “…research proves the sum of the two media, dollar for dollar, makes it worthwhile converging for retailers and advertisers." Henry then shares his personal opinion by saying,“I see them remaining as part of the mix rather than one overshadowing the other. Steven Morahan a DOOH recruiter and digital media, Internet and technology business developer from the Netherlands, accentuates the differences when he states that both are "two different ‘animals', really. They can benefit from each other." But he makes it clear that he sees DOOH coming out ahead and benefiting the most from mobile marketing. Just as with any new technology, it takes time for digital innovations to settle in and find their place. Justin Stark, national sales director at atmAd in London, agrees. He thinks that the rapid growth of smartphone use means "the next few years will see an exciting sea [of] change in this channel." But, Stark points out, "digital signage formats deliver highly valuable brand benefits mobile just can't touch." So Stark sees mobile as the platform where people will go for information or to “conduct business,” such as "seek opinions, buy, sell and interact." Whereas digital signage will "continue to play an important role in driving people to interact with brands, be it online or mobile," he said. Mobile marketing could outpace digital signage and then what? "As always, the really clever bit will be around integration—there is [a] big opportunity to deliver greater results through innovative planning," Heap said. Interestingly, Thomas argues, "Digital signage will have its presence in places, such as venues and transport, providing background noise. There might be some interactivity through QR, etc., but not many consumers will want to go through an intermediary channel when they can connect directly to brands through their mobile and in a highly relevant and personalized way." Now he’s got a point. And when that happens, the digital signage industry may find itself redefining how digital signage can be best deployed. Alan Brawn, of Brawn Consulting in San Diego, is in agreement. “By the shear number of mobile smart platforms out there, mobile will ultimately dwarf location-based digital signage,” he said. “The two mediums will live in harmony to some extent and the mobile platforms will ‘feed' off of location-based networks." "The big question is how they feed off each other and how will relative value be assigned," said Chuck Billings, senior vice president of GasStationTV. "[The] digital signage capital intensive business model can hardly stand the flight of value to its mobile partner,” he said. However, I can't help but conclude that is exactly what will happen." How true. Yet the concept is somewhat scary since digital signage advertising networks are, overall, still struggling to survive. This could be the tipping point for many DOOH networks. Pascal Cubb, founder of Cubb, sees the need to create an amalgam of all the technologies (digital, interactive and mobile) "to create a link between them." He reminds us, though, that if this phenomenon of convergence happens there is still the holy grail of all media: the need to find the right media for the right target at the right time. Also sure of this convergence is Darius Bruner, from Logic Wireless. "All of my executive summaries, patents, business plans, financials and meetings are based around the future of this convergence,” he said. “I would say yes, that this will change the way we communicate around the world during the next years and beyond." So, will mobile marketing overshadow digital signage and find itself at the bottom of the food chain? "Apple and Google both believe so," said Bobby Weiter, owner of High Tech Solutions LLC. So, as digital signage providers, are we ready for the impact of mobile marketing? Are we taking steps to integrate both platforms and seeing the value of both in a concise advertising campaign? Keeping up with the changes we face may mean survival of the fittest.